There are quite a few causes of seizures in dogs, from poisoning to brain tumors, and it is important to get a proper diagnosis to find out and treat the underlying cause. To control seizures, anticonvulsant drugs (such as phenobarbital) are often prescribed. But these drugs usually come with side effects. In particular, long-term use of phenobarbital is known to cause liver damage in dogs. 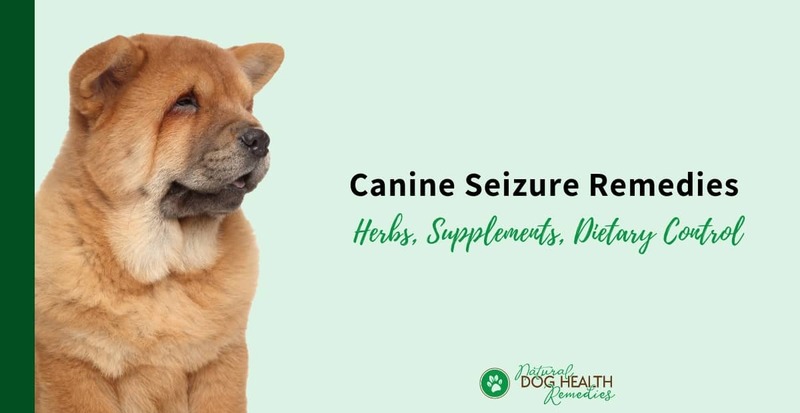 If your dog is being treated for seizures, and you want to use some natural canine seizure remedies to complement the treatment, this page is for you! Please note, however, that natural remedies cannot be used to replace conventional medications, especially without consultation with a holistic vet. However, if used appropriately, remedies can complement conventional drugs, so that the dog patient can have a reduced dosage of the drugs. 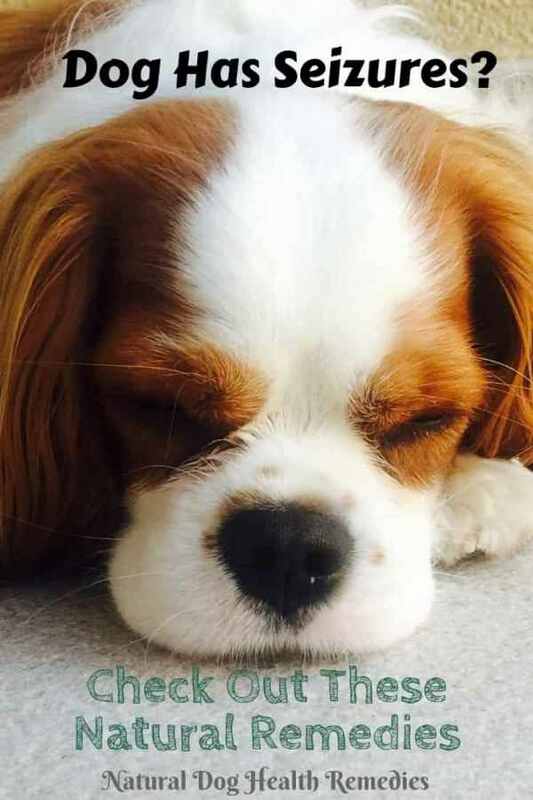 So what are some natural remedies for seizures in dogs? Let's take a look. There are a lot of anecdotal reports from holistic vets and dog parents that feeding epileptic dogs a natural, high-quality, protein-based, grain-free, home-cooked diet can make a difference. If you are unable to feed your dog a homemade diet, pay attention and read the dog food and dog treat labels carefully to make sure that food items that may be problematic to epileptic dogs are not in the foods or treats. For example, many dog foods now use natural preservatives such as rosemary and sage extracts - these are known to be able to trigger seizures in some dogs. You may also want to feed your dog smaller meals 3-4 times a day to keep his blood sugar stable, since low blood sugar (hypoglycemia) is one cause of canine seizures, especially in small breed dogs. 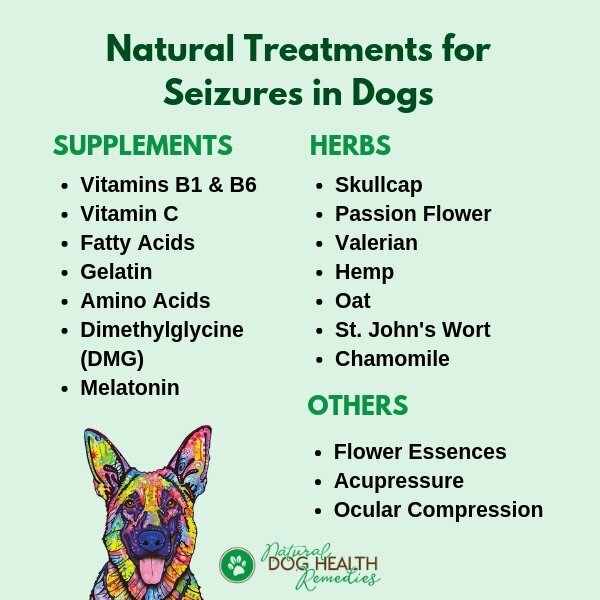 In addition to a natural diet, daily doses of vitamins and supplements that are beneficial to the nervous system are good canine seizure remedies that should be fed to an epileptic dog. Vitamin B1 is essential for helping brain function, and B6 is also important for the nerves. If you have an epileptic dog, it is a good idea to give your dog a B complex supplement daily. Vitamin C is a powerful antioxidant, which can help dogs with issues such as epilepsy. Fatty acids (fish oil, flaxseed oil, evening primrose oil, or borage oil) can reduce inflammation and degeneration of brain tissue. According to Canine Epilepsy Guardian Angels (www.canine-epilepsy-guardian-angels.com), gelatin has brain-protective and anti-inflammatory properties and can protect a dog aganist seizures and brain damages. You can simply sprinkle the powdered gelatin on your dog's food. You can also put the gelatin in your dog's chicken soup or bone broth, or even make "gummy bears" for your dog! Be sure to use unflavored gelatin only, not Jello or other sugar-added dessert-type gelatins. The amino acids L-taurine and L-tyrosine can increase the resistance to seizures. The amino acid L-tryptohpan can soothe the brain and is therefore beneficial for dogs with seizures. DMG is a compound that is produced naturally in both humans and animals. It forms an intricate part of animal and human metabolism. It also has antiviral, antibacterial, and anti-fugal properties. In animals, DMG also has anti-seizure effects. Dogs prone to seizures are usually emotionally sensitive. Tension, stress, sudden stimulation or over-excitement can trigger an episode of seizure in these dogs. Herbs that have calming effects can be used to help dogs prone to seizures. Hemp: Research on CBD hemp oil on controlling seizures looks promising. Hemp also has a calming effect on the nervous system. Many dog parents have reported positive results after using hemp oil on their epileptic dogs. Read this page for more information on hemp oil. This natural herbal formula contains useful ingredients (such as valerian, St.-John's wort, and chamomile) that are effective for treating canine seizures and epilepsy. Flower essences work very well on dogs and cats at an emotional level as these remedies were developed to deal with emotional disturbances. They help balance the emotional attitudes of your pet, and can in turn heal the body for physical problems such as seizures. Bach Rescue Remedy can dramatically calm an anxious, scared, or excited dog. Immediately before or during an epileptic episode, try rubbing a few drops of Bach's Rescue Remedy on the dog's ears. This will sometimes moderate the seizure and calm the dog. Acupuncture/Acupressure: Many dog parents have reported positive results upon treating their epileptic dogs with acupuncture and/or acupressure. Since acupuncture is invasive, be sure to find a trained, certified veterinary acupuncturist if you decide to give this treatment a try. On the other hand, acupressure can be given to dogs by their owners during an epileptic attack, which can help stop the fit and bring the dog out of a seizure. The acupressure point is immediately below the nostrils - where the nose meets the upper lip (if you have an acupressure chart, the point is GV26). Use your thumb to press and hold that point for about one minute during a seizure. You can also give your dog acupressure treatments on a regular basis in order to lessen the frequency and severity of future fits. See this article for more information. Melatonin: While researching this topic, I came across several articles that mentioned using melatonin for canine seizures, especially for seizures that happen at night time and early morning (between 11 p.m. and 6 a.m.). Usually melatonin is produced by the body (at night time), but sometimes for some reasons (e.g. aging), the body does not produce enough melatonin and this can result in certain symptoms, such as restlessness, depression, and so on. Some dog parents have reported positive results in the use of melatonin to control canine seizures that happen at night. Melatonin can be purchased from many health food stores or online. Recommended dosage is 3 mg for a 35-100 lb dog. Ocular Compression (OC): This is another treatment that I came across while researching the topic of canine seizure remedies. I am not sure how effective it is, but just wanted to include this here if you ever want to research more. Simply put, this OC technique is just to apply pressure on one or both eyes, while the dog is having a seizure, or just before the fit comes on. This pressure stimulates one of the cranial nerves (Vagus Nerve). This causes GABA to be released into the brain. GABA is a "chemical messenger" (an inhibitory neurotransmitter) that decreases brain activities that have gone out of control. Some dog parents who have used this OC technique have seen shorter seizure attacks and fewer post-seizure adverse effects (e.g. confusion, disorientation). A word of warning: Since pressure has to be put on the dog's eyes, this technique should NOT be used on dogs with eye problems (e.g. glaucoma). Canine Epilepsy Guardian Angels (www.canine-epilepsy-guardian-angels.com). Consider giving the herb milk thistle to your dog if he is on phenobarbital to help support the dog's liver.